Green Peace Resort is Located North of Lake side 900 meter out from the major tourist area, north west from camping chock called Sedi Bazaar, Lake side, Pokhara, Nepal. Surrounded by beautiful landscape of open farming rice paddy field and fascinating lake view, the resort is unique to the place. Beautiful garden with in the resort engraves the true nature welcoming different birds at seasons… especially the three different kinds of kingfishers that inhabitant in the region. For the comfort and homely environment, the resort includes a beautiful large hanging rock garden. 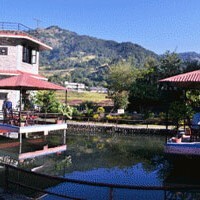 The resort also includes a typical fishing pond for the guests. The island café and the mini bar are also operated in the resort to provide the full service.. Rooms are large, very comfortable and facilities include – multi channel television and intercom telephone system and refrigerator. All rooms have wall to wall carpet & attach-bath and along with top bath in some. Staff members are experienced and friendly and are always willing to assist through all your stay in resort to make it comfortable and enjoyable. The resort is designed owned and run by the same management of Green Peace Lodge & Restaurant with much smarter concept to meet the all level of comforts and services.